If there is one thing the US government should’ve learned already, it is that prohibitions don’t work. It has tried (and failed) to ban the sale and consumption of alcohol between 1920 and 1933, and we all know how it ended: organized crime groups have gathered massive fortunes, and the sale and consumption of alcohol never stopped. Online gambling, especially sports betting, is in a similar situation today. US citizens are unable to play at most casino sans dépôt, as they call them in Canada, as the US government has banned banks from processing transactions to and from internet gambling venues, while sports betting is illegal under 1992’s PASPA (Professional and Amateur Sports Protection Act), which bans all forms of sports betting in all states – with the exception of Nevada and a handful of other states with little more than sports pools. Just like in the case of alcohol, the betting ban has led to the rise of a massive underground industry. Some estimate that it has a turnaround of billions, even hundreds of billions, each year. All this out of the reach of authorities, and without the states receiving a cent. 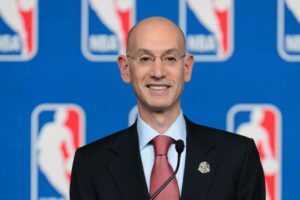 Back in 2014, NBA Commissioner Adam Silver has called for the end of the ban on professional sports through an op-ed published in The New York Times. In it, he pointed out that, despite the government ban on sports betting, it hasn’t disappeared. On the contrary – he called it a “thriving underground business” that “operates free from regulation or oversight”. Besides, he wrote, gambling has become a widely accepted form of entertainment in the US, with most states having lotteries, legal casinos, and some of them even having legal online gambling outlets with a considerable attendance. And, as he also pointed out, sports fans also have an “obvious appetite” for “a safe and legal way to wager on professional sporting events”. The piece urged the federal government to consider regulating sports betting instead of leaving it to run rampant underground. A few days ago, Silver went live on ESPN where he discussed, among others, New Jersey’s attempt to legalize sports betting within its borders. He made it clear that he is neither for, nor against sports betting. But he pointed out that sports betting is legal and regulated in many jurisdictions around the world, from Europe to Australia, and the professional sports in these countries haven’t suffered any consequences as a result. “[In Europe,] it’s closely regulated, they can monitor if there’s an irregularity activity, something we cannot do right now because it’s largely all illegal”, he said, cited by Legal Sports Report. Silver would be against a state-by-state regulation of the industry without a federal legal framework governing the matter – and he is right. In Europe, there is an EU-wide legal framework governing sports betting, and an EU-wide organization of betting operators self-regulating and monitoring activity to pinpoint any irregularities and suspicious activities. Perhaps the US should learn a thing or two about the EU’s stance on the matter, especially since it has extensive experience in regulating various gambling activities within its boundaries.